.I got this recipe via my Curry Head brother who has a keen eye for delectable curries.This is so flavourful and fantastic in a way that is very different from other curries I’ve had (and I’ve had a lot). The ingredient list is a bit daunting….don’t be scared! At least that’s what my brother told me. Just put all the spices and everything you need on the counter…chop, prepare, measure and the next thing you know you are in the midst of magical curry alchemy. Curry Head got the recipe from a site called The Amateur Gourmet… and it turns out the Amateur Gourmet has tons of great recipes including one for deviled eggs which will be part of my 60s appie feature at our Christmas party! Nothing ever happens without a good reason! The list of spices for this recipe is a bit long and unusual…you’ll need things like star anise, fenugreek seed, kaffir lime leaves, cardamom seeds, pineapple juice, lemon and orange peel…and so on and so on….It is a cornucopia of spices that all comes together in a magical way. The original recipe calls for lamb…we’re not lamb eaters but I think you can substitute chicken or chickpeas for a veggie version. Once you you have everything, this is easy to make and cook. And what a great addition to your curry portfolio! Thanks Curry Head for the big heads up! Make the curry first by combining the toasted spices, cloves, star anise, cardamom, lime leaves, red pepper flakes, nutmeg, and turmeric in a spice grinder or clean coffee grinder, and grind them until you have a very fine powder. Heat a large Dutch oven or other heavy ovenproof pot over medium high heat and add the olive oil. When the oil just begins to smoke, add the shallots (or onions) and garlic [note: if I had to do this again, I’d wait to add the garlic so it doesn’t brown before the onions!] and cook, stirring often, until they’re deep brown, about 10 minutes. Add the ground spice mixture, cinnamon stick, and ginger and cook, stirring constantly, for 3 minutes. Stir in the tomatoes and salt (I didn’t add all 2 tablespoons at first–it seemed like so much!–so I added 1 tablespoon here and about 1/2 tablespoon later to taste), stirring frequently, until most of the liquid has evaporated and the mixture looks quite dry, about 15 minutes. Stir in the cilantro, citrus peel and juice, and pineapple juice, then remove from the heat and set aside. In a large skillet, heat 2 tablespoons of olive oil over high heat until smoking; meanwhile, season the lamb with lots of salt. In batches, brown the meat (believe me: it’s worth doing this in batches–I crowded the pan and ended up with gray meat) all over, 12 to 15 minutes per batch. As the pieces finish browning, use a slotted spoon to transfer them to the Dutch oven with the curry mixture. Brown the following batches in all the nice fat remaining in the pan, transferring the pieces to the Dutch oven as they are done, and then discard the fat. 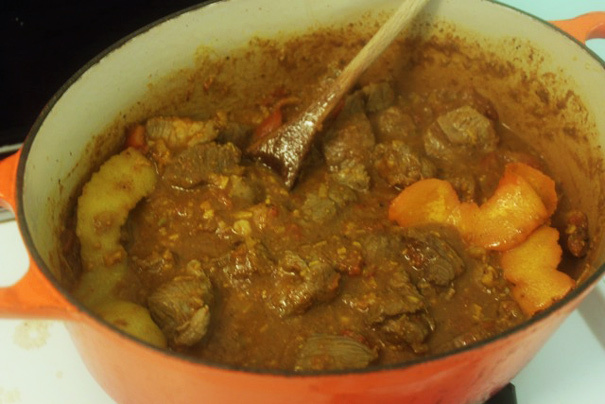 Give the lamb pieces a good stir to coat them in the curry mixture, cover the pot, and put it in the oven. Cook the lamb 1 1/2 hours, stirring now and then. Reduce the heat to 250 F and let it go until the lamb is fork tender but not totally falling apart, another hour or so. Serve over rice and garnish with cilantro leaves, if you like. You may be freaking out about some of these ingredients–kaffir lime leaves? fenugreek? pequin chilies?–and normally I’d tell you to go ahead and make it without them, but, instead, think of this as an opportunity to do some serious spice shopping, either in real life or online. The exotic spices in this dish are part of what makes it taste so special.